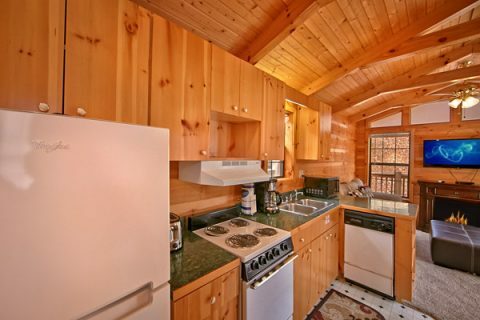 Looking for cheap cabins near Dollywood? 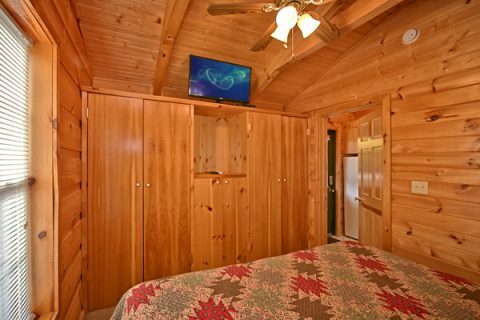 "Where The Magic Happens" provides vacationers with a location near Dollywood and nearby Pigeon Forge attractions and offers all the comforts of home. 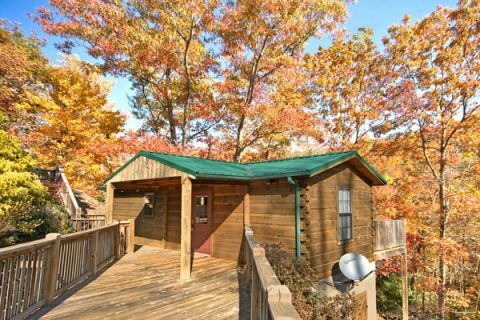 This cabin boasts a prime location and stays within your budget, making it a Smoky Mountain vacation deal you won't want to pass up! 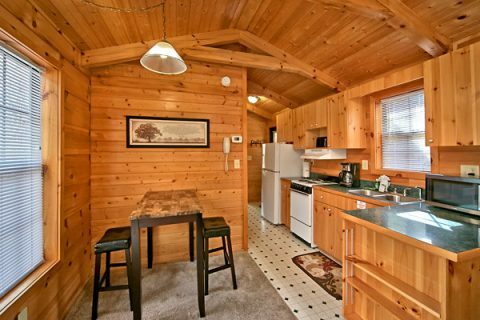 Who says you can't enjoy cabin living on your Smoky Mountain vacation with a tight budget? 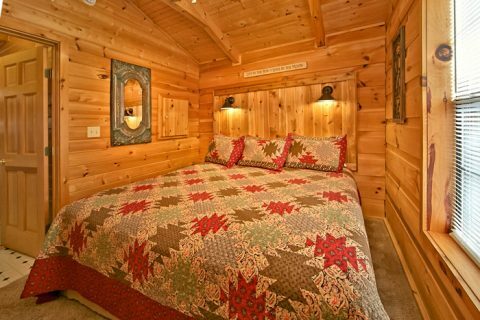 "Where The Magic Happens" provides guests with a snug 1-bedroom cabin with comfortable furnishings that invite you to relax – all while staying within your budget. Watch your favorite film on the 40-inch flat screen television in the living area while the electric fireplace casts its warm glow on the room. Set the mood for a romantic dinner with candles and roses on the bistro dining set for two. 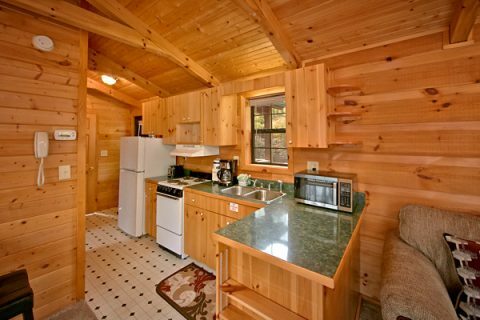 Cook your sweetheart's favorite dish in your cabin's nearby kitchen. 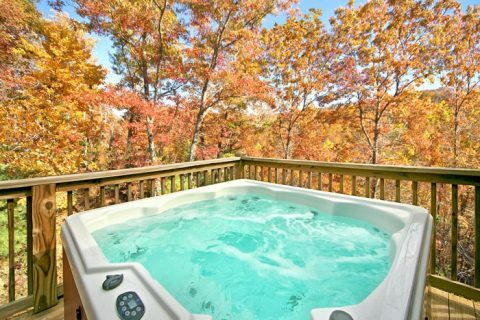 In the evenings, unwind in the warm waters of your hot tub, resting in each other's arms. When it's finally time to retire for the evening, relax in your king-size bed while watching the flat screen television. 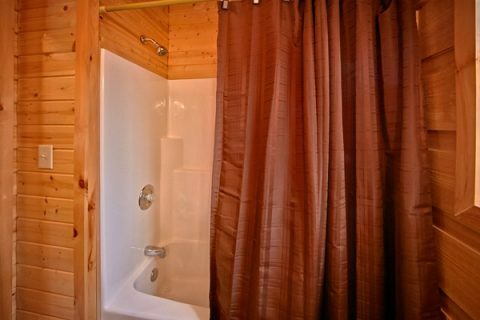 "Where the Magic Happens" stands out from other cheap cabin rentals near Gatlinburg by providing comfort as well as an agreeable price. 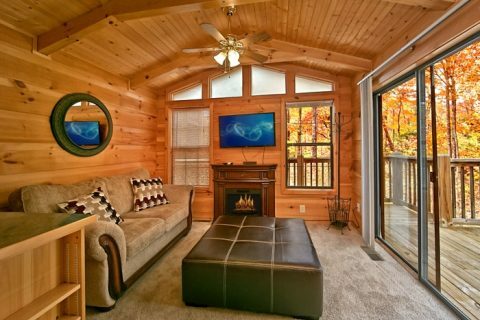 Located in the Paradise Ridge area, your cheap cabin near Dollywood places you and your guests less than 5 minutes from specialty outlet stores at Tanger Outlet Mall. Another two minutes down the road rests Downtown Pigeon Forge and all its dining, attractions, and shows. 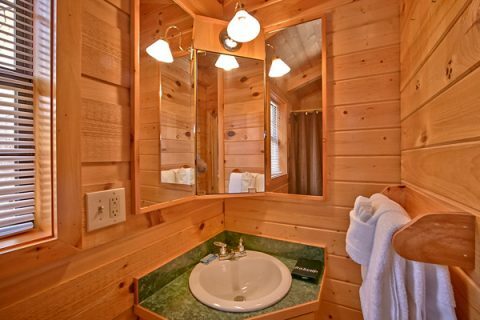 Need several cheap Pigeon Forge cabin rentals for additional family members or your group? 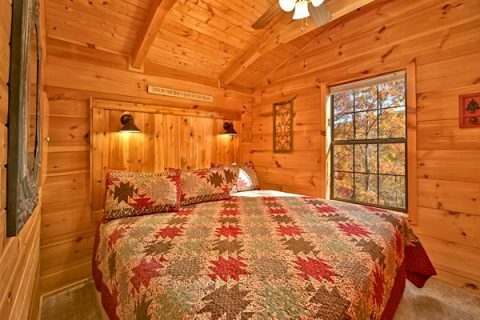 "Where The Magic Happens" lies within walking distance of "A Long Kiss Goodnight," "Enchanted Moment," "Secret Rendezvous," "Cloud 9" and "Wonderland" cabin rentals, creating the perfect cabin grouping for an affordable family reunion or church retreat. Book already cheap cabins near Dollywood online today with Cabins USA Gatlinburg for an additional immediate Online Savings for a budget-friendly, unforgettable vacation!